NGSS Background: What is 3D Teaching? The Next Generation Science Standards were developed so that students could learn science in the way that scientists do science. In this framework, there were three dimensions developed that have equal importance. The Disciplinary Core Ideas for each grade band were revised, which were formerly referred to as the standards. In addition, the Scientific & Engineering Practices were added, which include the skills and methods that scientists have and use, and that students should also master. The practices are the methods, or the “how,” the content is explored. Finally, the dimension of Crosscutting Concepts was included, which is a knowledge base that adheres all of the fields of science, along with other unifying fields such as mathematics, social sciences and language arts. 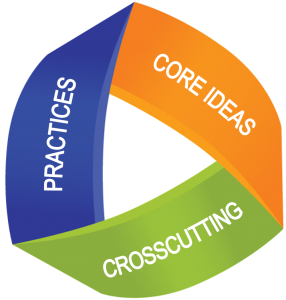 Crosscutting Concepts provide the lens, or focus, for the practice and content. For more on what the conceptual change process and 3D teaching mean for teachers, take a look at From 1D to 3D. If students are to learn these three dimensions, then all three must be explicitly taught. Each lesson and unit should be designed to incorporate all three dimensions, thus being 3-Dimensional. Additionally, every lesson should be assessed for how effective each dimension was taught and learned, and students should also be assessed in these dimensions objectively and effectively. Effective assessments reflect all three dimensions and do not separate them. In order to implement these new standards, science must be perceived and taught differently. The focus should be on students grasping these skills, concepts and content, and students must be able to design their own investigations to answer their own questions. Emphasis should also be on student sense-making, discourse, and higher-level thinking. NGSS Content is more narrow and provides for deeper exploration of phenomena. Crosscutting Concepts and Practices are viewed as long-term learning goals throughout the entire school experience and, ultimately, life-long learning tools to aid in sifting through information and experiences. This change in teaching science requires a conceptual change for both the teacher’s pedagogy and the students’ skillset or mindset. This is a process, and the Toolkit is designed to provide tools for this change. This toolkit was developed as a professional development resource to train teachers in the concepts of the Framework for K-12 Science Education and the Next Generation Science Standards. It is the product of the STEM Framework Course component of the MPRES Grant. The purpose of the MPRES Toolkit is to assist teachers of science in the conceptual development and acquisition of the 3-Dimensions of the K-12 Science Framework (Scientific & Engineering Practices, Crosscutting Concepts, and Disciplinary Core Ideas). The Toolkit is not intended to be used as curriculum for classroom instruction, and it will not work as a recipe box that can be transfixed to specific classrooms. The tools provided here, along with a professional development trainer’s expertise, will help you bend and shape your classroom pedagogy into a 3-Dimensional form that is successful for your grade level, content, and style. Examples of 1D, 2D and 3D lessons are provided, as well as testimonies from MPRES teachers on the changes they made and how they intentionally designed lessons to train students in all three dimensions and subsequently assess student mastery. Artifacts and examples of student work are also provided. Finally, rubrics and lesson templates are available for teachers to map their own conceptual change while implementing the NGSS. The goal is that teachers of science fully implement Science & Engineering Practices in coordination with Crosscutting Concepts and Disciplinary Core Ideas in all their teaching, and that Practices and Crosscutting Concepts will become a natural component of their teaching repertoire. This toolkit provides a starting point to engage in the steps listed above. Start by reviewing A Framework for K-12 Science Education: Practices, Crosscutting Concepts and Core Ideas (2012) pages 1-40. Each Practice is outlined in the toolkit following the predicted continuum of change for teacher growth through both reflective questions and activities for the Practice in the classroom, connected to relevant Crosscutting Concepts. Each Practice also includes implementation activities, resources (podcasts, links, etc.) and reflective questions. These allow learners to work through the Conceptual Change Model by reflecting on each of the steps of the model: Awareness, Expose Beliefs, Confront Beliefs, Resolve Beliefs, Extend the Concept and Go Beyond. The activities included within the Toolkit are intended for implementation of the Practices for both the facilitator of the activity as well as for the participants. Each activity may be listed in more than one Practice as varying depth of the activity will lend itself to varying Practices, and activities are also linked to applicable Crosscutting Concepts. The questions posted for each step of the continuum of change are intended to be shared in a professional learning community (PLC) between professional development facilitators of prescribed activities, but the questions can also be used for personal reflection as part of the life-long learning process. Finally, each Practice within the toolkit includes a Learning Progression of the Practice in varying grade level bands. This will help the learner fine tune the Practice to his/her classroom, pupils, and capacities. These are not set as limitations but as guidelines to assist a larger picture beyond the Toolkit learner.